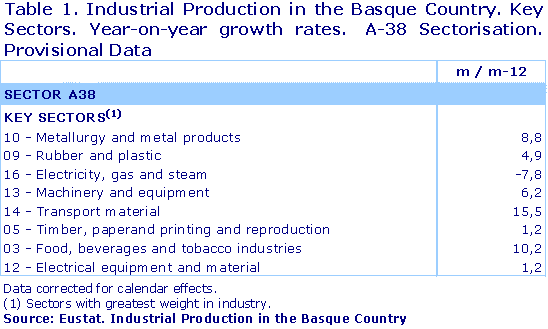 Industrial Production of the Basque Country grew by 1.0% in February 2011 compared to the same month of 2010, in homogenous terms of the working calendar, according to EUSTAT data. 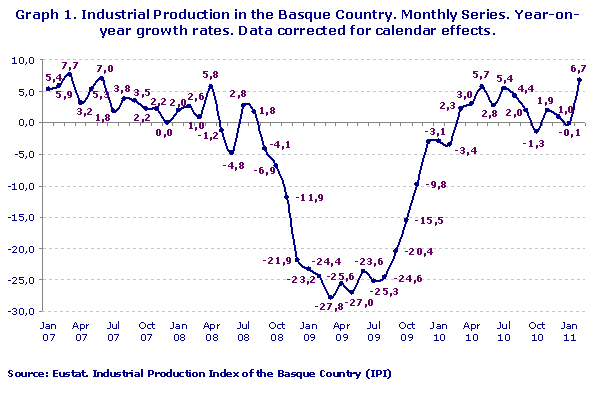 Compared to the previous month, January 2011, industrial production in the Basque Country rose by 1.3%, once corrected for seasonal effects. By sector, and using the major industrial sector classification, the evolution of the index for February 2011 compared to February 2010 was positive in all sectors: Energy rose by 9.9%, Intermediary Goods were up by 10.7%, Capital Goods by 2.2% and Consumer Goods increased by 0.6% overall, as the result of the increase recorded by Consumer Non-Durables (4.2%), as Consumer Durables fell by 10.5%. The year-on-year fluctuation in February 2011, compared to January 2011, was positive for all the major industrial groups, except for Capital Goods, where there was no notable variation (0.0%). Energy rose by 2.0%, Intermediary Goods by 4.2% and Consumer Goods, overall, by 5.5%, as a result of the rise registered by the prices of Consumer Non-Durables (7.6%), as Consumer Durables fell by 1.9%. The key sectors that posted greatest growth in February 2011 compared to the same month of the previous year were Transport Material and Food Industries, Beverages & Tobacco, with rates of 15.5% and 10.2%, respectively. On the other hand, the Electricity, Gas & Steam sector registered a year-on-year downturn of 7.8%. 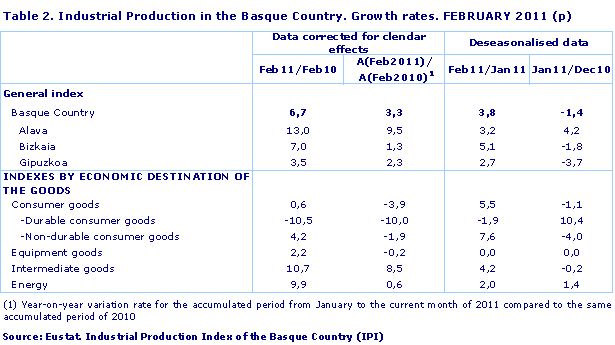 By province, the February year-on-year performance for the Industrial Production Index was positive in the three provinces: it rose by 13.0% in Álava, 7.0% in Bizkaia and 3.5% in Gipuzkoa. The month-on-month growth rate was also positive in the three provinces. It rose by 3.2% in Álava compared to January 2011, while there were increases of 5.1% and 7.2% in Bizkaia and Gipuzkoa, respectively.